Alice Cooper is bringing his 'Ol' Black Eyes Is Back Tour' to the UK this autumn. The 'Poison' hitmaker marks the 50th anniversary of his debut album 'Pretties for You' in June, and to celebrate he's put together a brand new show, which will come to Manchester, Aberdeen, Leeds, Brighton, London, Birmingham and Cardiff this October. He'll be joined by support act The Stranglers and special guests MC50, the supergroup featuring Wayne Kramer, and Soundgarden's Kim Thayil and Fugazi's Brendan Canty. Commenting on the shows, which kick off at Manchester Arena on October 4, he said: "We're coming back in October for a big tour with our new show 'Ol Black Eyes Is Back' it's going to be a great night with my very special guests The Stranglers plus the MC50." It's no coincidence that the MC50 are joining Cooper for the shows as the 71-year-old shock rocker was a part of the Detroit music scene in the 70s' along with Kramer's group, The Stooges and Bob Seger, to name a few. The music legend will once again be joined by his exceptional touring band members; bassist Chuck Garric, guitarists Nita Strauss, Ryan Roxie and Tommy Henriksen and drumming legend Glen Sobel. As well as all of the classics, such as 'Schools Out', 'Billion Dollar Babies' and 'No More Mr Nice Guy', Cooper will play songs from his most recent album, 'Paranormal', which features guest spots from the likes of ZZ Top guitarist Billy Gibbons, U2 drummer Larry Mullen and Deep Purple bassist Roger Glover. 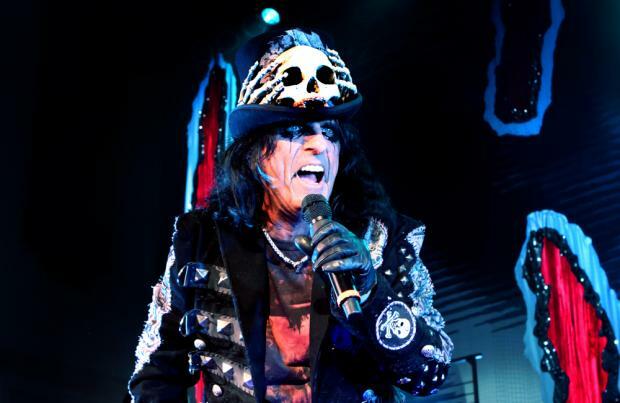 The last time Cooper brought his incendiary freak show to the UK was with The Hollywood Vampires – also comprised of Aerosmith's Joe Perry and Johnny Depp – last June.